Link to the interactive version of Sir William Arrol’s timeline . Sir William Arrol was arguably the most celebrated engineer of the Victorian age. He was pioneering in his use of steel for construction and pushed the boundaries of bridge building, making him famous throughout the world. When his company built the Forth Bridge, it was the first major structure to be built primarily of steel and the longest cantilever bridge in the world. After the disastrous collapse of the first Tay Bridge, Arrol was the man they sought to build the replacement bridge and restore the country’s faith in rail bridges. He quickly went on to build the steel superstructure of London’s iconic Tower Bridge, the largest bascule bridge of it’s time, and numerous other bridges in Britain and abroad. Arrol also constructed specialist industrial cranes and workshops, most famously, for ship-building giants Harland & Wolf who chose Arrol to construct the massive gantry where their sister ships HMS Titanic and Olympian were built. 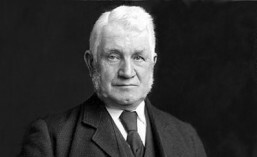 Sir William Arrol had the ingenuity to implement engineer’s designs on a practical level, overcoming physical and environmental barriers to construction. He often came up with new techniques and inventions which would be subsequently be adopted as standard practice in industry, such as the hydraulic rivetting machine, which not only speeded up construction but produced a consistently stronger seal between the rivet and girder and improved safety. But this was no man with the privilege of a grammar school education and business connections to set him on the road to success. The son of a weaver, he had to start work in the mills at the age of 9 years to help support his family. Despite only a basic education, however, he was determined to learn, and studied in his spare time. His characteristic drive and hard work ethic were evident throughout his life, firstly educating himself, then walking the highways in search of work, competing for contracts for his new business, then striving to push the boundaries of his business into bigger and more technically challenging projects. This website began as an idea for an assignment when I was a student back in 2003. It struck me that few people seemed to know who Sir William Arrol was and yet everyone was familiar with the great structures he built, like the Forth Bridge and Tower Bridge. It was not until 10 years later with the encouragement and support of the Friends of Seafield House that I finally started putting that idea into motion. As well as demonstrating his engineering achievements I also want to show other aspects of Sir William Arrol, his personal life, political life and other business interests. It is still very much a work in progress. A wee snippet that might interest you. My Shetland grandmother worked as a maid for the Arrols in Edinburgh and also at Seafield House where she met my grandfather, a labourer on the estate. He became a fruiterer and florist in the Canonmills district of Edinburgh and, despite their earlier penury, rapidly rose to join the middle classes and send their son to a private school. Hi Sian. Thanks very much for sharing your family connection to the Arrols. It’s always great to get more stories about the family and house. I’d like to find out more and will send you an email to chat about it. Have you also seen the website for Seafield House? https://friendsofseafieldhouse.wordpress.com. It is lovely that your grandparents met there. to be submitted to develop the house and grounds for residential properties. So hopefully it’s future is secure.